Banausics is a multi-media installation, which was created during the gallery’s fourth annual summer artist-in-residence programme. The artwork implemented robotics and video projections as means to create drawings during the exhibition period. 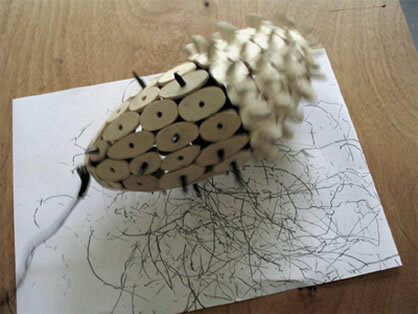 Activated by the sound of the videos, the urchin-like structures, pegged with graphite, move and bobble atop sheets of paper to make incredibly rudimentary, but systematically beautiful drawings.